Unfortunately, there have been several versions of the thickness of the filters circulating around. In the first column of the table you will find the REAL values of the filters installed, while in the second column you will find the values used in the calculations. The nTOF energy spectrum has been taken from Vasilis latest simulations (1/6/2002). 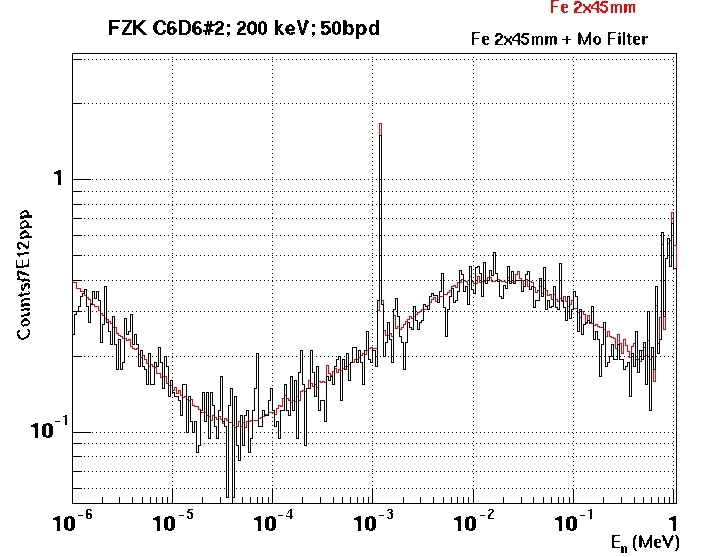 The experimental data for the Fe measurements with filters have been provided by Cesar. 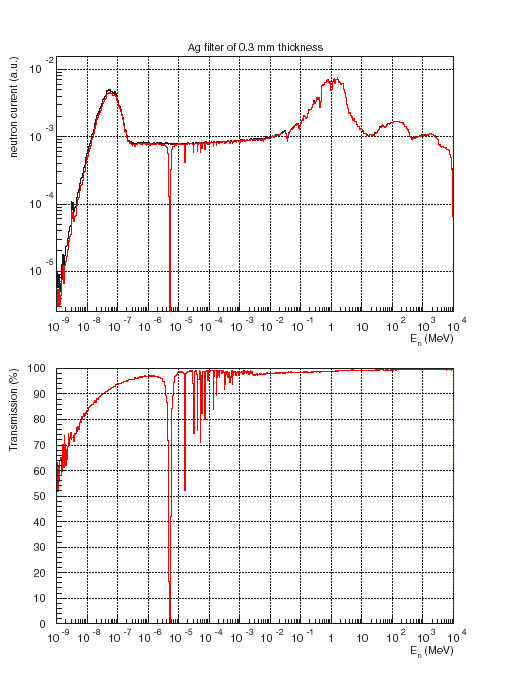 As you can see, the average effect of the W filter is an attenuation of the neutron beam between 5% and 10%. In beam gamma rays are attenuated in a similar factor (Jose´s simulations GEANT3 for a realistic spectrum + Daniel´s simulations with MCNPX for a white spectrum). The main resonance is fully saturated and the neighbouring ones are also clearly visible. 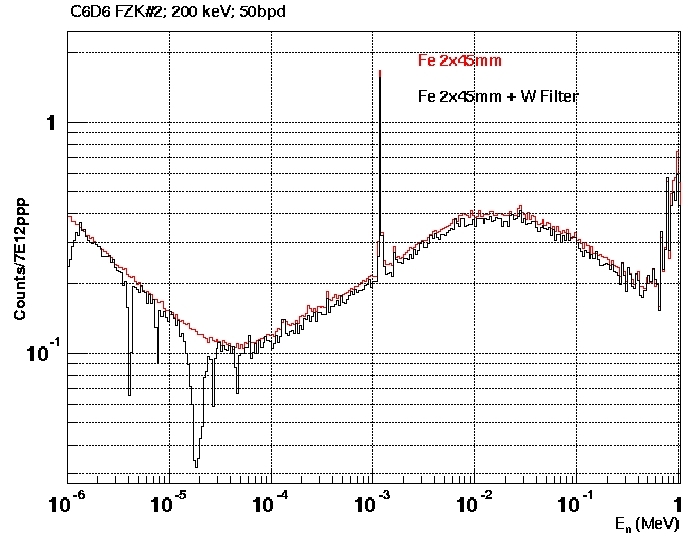 The average effect of the filter is an attenuation of the neutron beam of 20% between 1 eV and 5 keV. The main resonance is not fully saturated but still clearly visible. The attenuation of the in-beam gamma rays should be also of 20% for a white spectrum (see Jose´s simulation for the simulated in-beam gamma ray spectrum attenuation). The average attenuation of the Ag filter is below 5%. The main resonance is fully saturated and the smaller ones at higher energies are also visible. The attenuation of the neutron beam is below 10% above 1 keV. The resonances in the eV region are saturated and thus clearly visible. 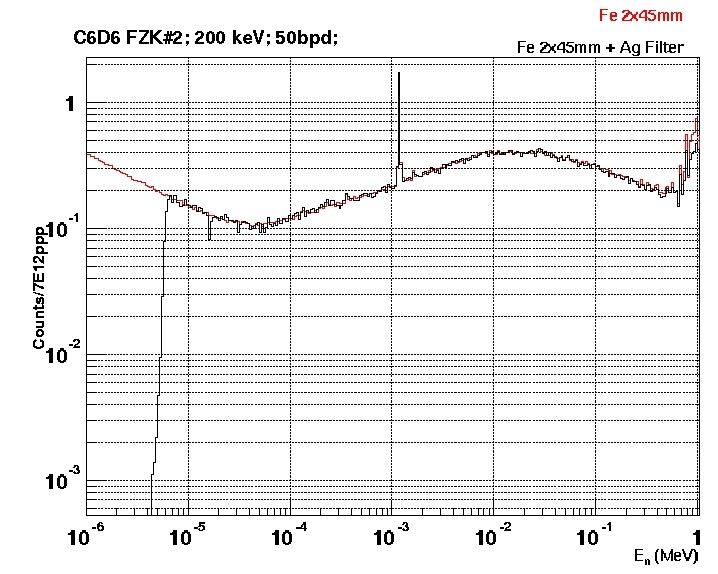 The comparison of the calculations with the Mo filter + Fe sample data indicates that most likely the Mo filter was not in place during the measurement. 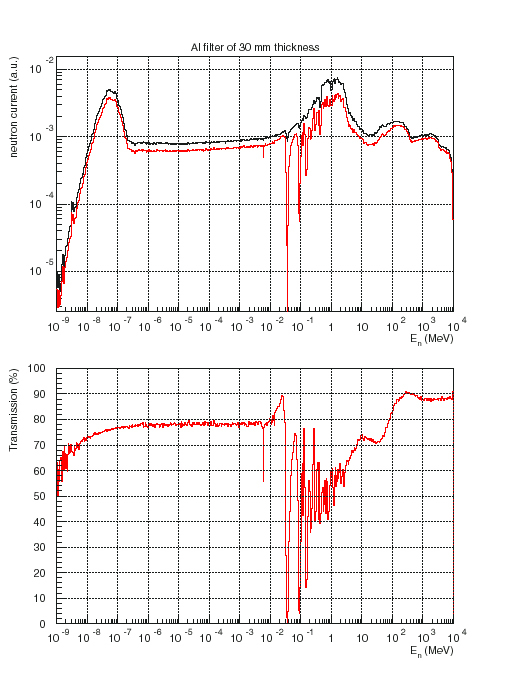 The overall attenuation with the Al and W filters are well reproduced by the experimental data. 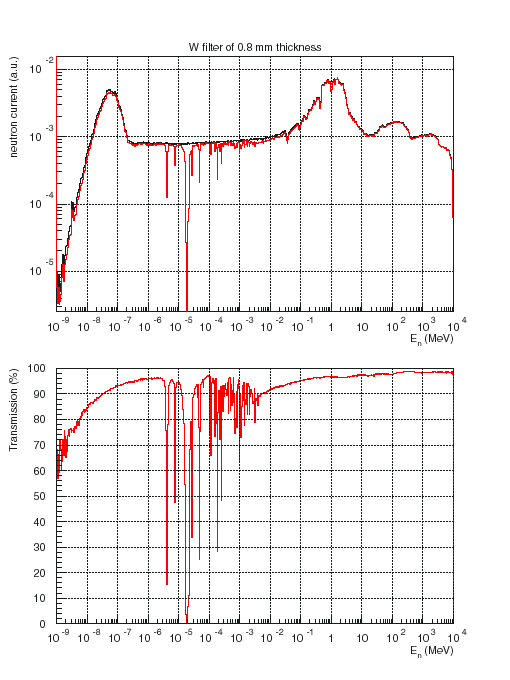 The Al resonance is not observed, which indicates that the bump at higher energies is not sharply time-related with the neutrons (in-beam gamma rays). 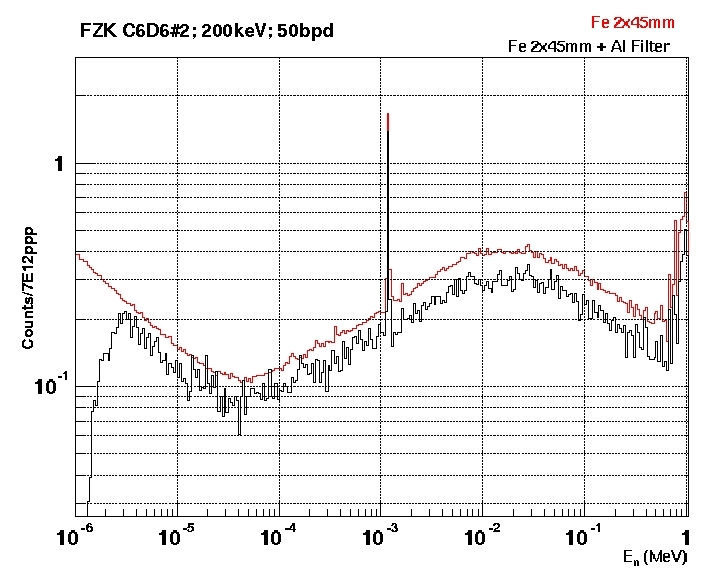 The W resonance, although with a smaller depth than the predicted one, is visible in the TOF spectrum. Its presence evidences that the linear (in log-log scale) component of the background is sharply time related with the neutrons. 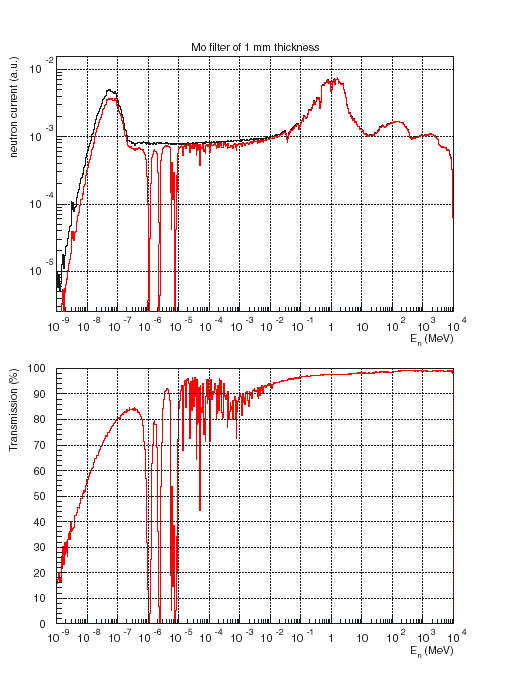 The holes observed in the TOF spectra at lower energies, mainly in the measurement with the Ag filter, are not predicted by the calculations made. A possible origin could be the presence of impurities in the filters (Cd, In…)?? ?